Courtney Cox before and after plastic surgery, botox. 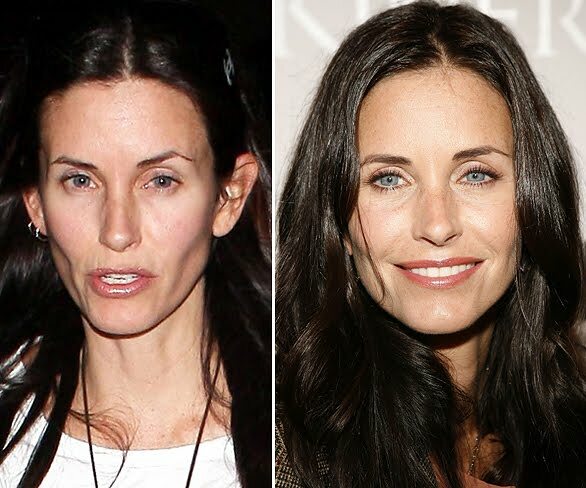 Just a few years ago there began to start a whisper about Courtney Cox and the way her appearance started to change, most noticeably the tightening of her face and disappearance of wrinkles. Naturally everyone thought plastic surgery was the culprit and once those rumors began to hit the fan, Courtney Cox came clean in an interview with Marie Claire magazine. "Botox? I think it’s fantastic and also horrible. I mean, they’ve come up with this stuff that can make you not look angry. But you have to use it sparingly…"
"I went to this doctor once and he was like, 'Oh, let me do it just here and here and here.' And I was miserable. I mean, I'm an actor, I’ve got to be able to move my face…"
"When people start messing with their foreheads and can't lift their eyebrows, that's weird. It's not that I haven't tried Botox – but I hated it." Courtney Cox makes it sound like she's done with getting botox injections, however from the looks of her current photos i would guess that she still makes regular visits to the doctor. And then came the rumors of Courtney Cox and breast implants, so stay tuned. sorry but all your pics show me ,is a woman without any makeup & one who is made up for an outing on the town. most women do look different without our war paint. Of course most people look different without makeup- but you can clearly see that she has had plastic surgery- and there's nothing wrong with that, everybody does it. You can tell by how smooth her skin is, and her lips, especially. Cortney is gross either way. Not attractive at all.